“There’s no such thing as Christian Yoga,” Sam said in his soft-spoken voice. He stared at me like I was clueless, and I stared at him wondering if he was kidding. “I know,” I said. Of course I knew. Obviously I knew. “That’s why I’m writing on it,” I tried to explain, and then stared, wondering if he was kidding, and he stared, wondering if I was kidding. It was a cultural disconnect. Sam was born and bred in India where yoga is practiced universally and where yoga is a mandatory practice in public schools. (Pending legislation may soon make it mandatory in private schools, like Sam’s Christian school, he said.) Sam understood yoga, unlike most Americans, so when I asked his opinion on Christian Yoga he probably thought I was either kidding or a typically-ignorant American. Sam Stephens is the little guy sitting opposite me. Sam, on the other hand, did not live in the amorphous world of Americanized Christianity, where Christian Yoga is no more irrational than Christian Atheism. Yes, there really is a large population of atheist and unbelieving pastors working just for the money, not because it means anything. 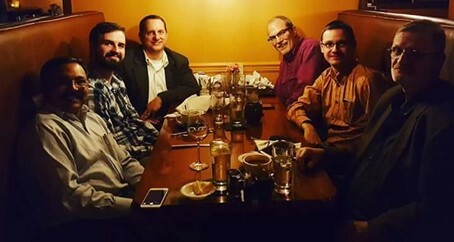 Bart Erhman, for example, is both an outspoken atheist and the Department Chair of Religious Studies at the University of Virginia. Is there not some occupation better suited for an atheist? But he does make a fortune writing books on the New Testament. Since money saturates Americanized Christianity, it creates all kinds of compromised beliefs and behaviors. It affects most of us Christians, to some degree. Americanized Christianity is highly consumer-friendly, which also explains why Christian Yoga exists here, contrary to Sam’s understanding. Christian Yoga is also contrary to thousands of years of history, where yoga has always been Hindu, “rooted in over 5000 years of ancient Indian texts and traditions,” as Harvard Medical School correctly puts it. Yoga is big business in America, “where more than a third of Americans say they are very likely to try yoga in the next year.” (Harvard:Yoga) As a burgeoning consumer product, everyone is jumping on the yoga bandwagon, all the way to the White House, where President Obama officially designated yoga the “universal language of spiritual exercise” and incorporated it into the Presidential Fitness program. (See Wikipedia:Yoga:Obama) Following the yoga fad, Americanized Christians are jumping into it like any fitness fad, despite significant compromise. “For Christians, the problem with Yoga is the inward focus,” Sam told me. “Christians should be focusing away from themselves,” like toward others and God’s Word. Unlike Americanized Christianity, in India Christianity is heavily persecuted, so the lines between Christians and the surrounding Hindu culture are sharp and plentiful. As a Hindu spiritual discipline, yoga is not only foreign to biblical thought, it is hostile to a healthy Christian life in several ways. Unlike physical fitness routines, yoga’s popularity comes from offering “the perfect antidote to the modern speed of life that’s created a culture of stress and burnout,” and “something of a panacea for the ailments of modern society — tech overload, disconnection and alienation, insomnia, stress and anxiety.” The medical profession is drawn to it because, “Yoga has been shown to help fight everything from addiction and lower back pain to diabetes and aging, in addition to boosting overall well-being and stress relief.” (Huffington Post:Yoga) The advertised benefits of the Mindfulness fad are similar. The stress-relieving, healthy benefits of yoga far exceed what physical fitness routines usually advertise. “Across America, students, stressed-out young professionals, CEOs and retirees are among those who have embraced yoga, fueling a $27 billion industry with more than 20 million practitioners — 83 percent of them women,” the Huffington Post reports. Since Harvard Medical reports 36 million practitioners as of 2016, the pursuit of yoga’s stress-relief may be far more widespread. “People who do yoga are 20% more likely to have a positive image of their own physical and mental health, including a stronger sense of mental clarity, physical fitness, flexibility, and strength,” according to Harvard Medical School. Benefits like mental health, mental clarity, positive image, fighting addiction and “boosting overall well-being and stress relief” are not the typical claims of physical fitness. 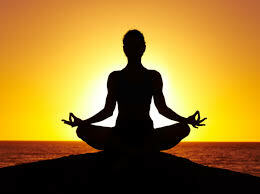 Since “people in the West get into yoga for physical fitness and stress relief,” it does not necessarily include yoga’s “rich history of philosophical and ethical principles, breathing exercises, and meditation.” (Harvard:Yoga) If the spiritual teachings are not included, as it is claimed, Christians assume there is nothing particularly religious or spiritual about yoga. Without disputing the benefits of yoga for non-Christians, it is difficult to understand why Christians would trust in non-Christian solutions, especially since God offers a much better one. God’s peace includes real solutions, not just a feeling of stress relief, which is why we entrust our problems to Him in prayer. Surely God’s approach must be superior, since it includes the power, insight and direction to resolve and overcome stressful situations. “For Christians, the problem with Yoga is the inward focus,” Sam said. Not having a personal relationship with God and relying on human strength, it is not surprising that non-Christians find some kind of solace in yoga. For the Christian, however, all the many benefits of yoga (and Mindfulness) directly contradict trusting in God. Yoga is a Hindu solution to stress. There is no such thing as Christian Yoga. NEXT UP: Another dozen reasons why Christian Yoga is a myth. Hey Keith, interesting post. I have had lower back pain for years, and have always heard that Yoga is helpful for back pain but I’ve never done it. Do you think it is possible to do Yoga merely as in just doing the stretches on your own, while avoiding all the inner peace pseudo-spiritual stuff? Yes, but it’s not called Yoga, it’s called physical therapy, which would be highly superior to yoga, where u can injure yourself.